Cold air, escorted by a couple of cold fronts coming down from Canada, produced an unseasonably cold day in Anderson, where the high didn't hit 70 degrees. 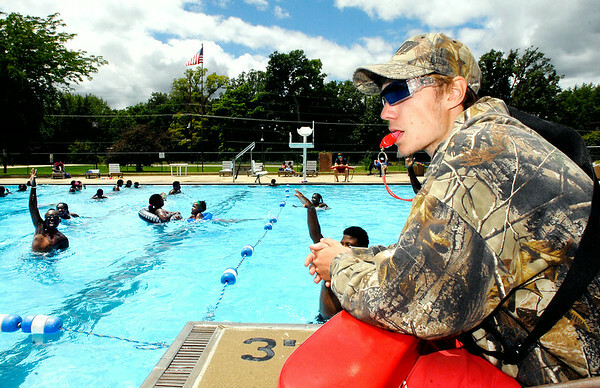 Here Southside Pool lifeguard Ryan Connelly bundled up with a long sleeve jacket and hat to ward off the chilly air and brisk northwest winds Tuesday as kids from the Geater Center Summer Camp enjoyed the water. The National Weather Service based out of Indianapolis said 70 degrees was the record for coldest high temperature in the area. Residents can expect the cooler weather to continue for the next few days although Tuesday is the only day that will stay in the 60s. Overall, this month has been cooler than usual through the first 14 days. The average high for Anderson is 84 degrees but this month's average has been just 80 degrees. The city has yet to get to 90 degrees in July according to NWS.